Just because you have a day job doesn't mean you can't make waves in your music career. 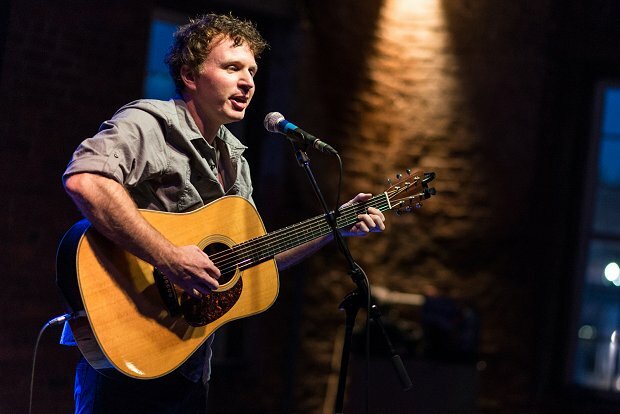 While working a full-time job in Nashville, folk musician Adam Burrows was honing his chops at writers' nights and playing as many shows as he could in the famous music mecca. From there, he managed to score gigs at major festivals like Music City Roots and Musikfest through Sonicbids, and with those experiences under his belt, he spent last year on an extensive North American tour as support for Australian singer-songwriter Stu Larsen. If you're wondering what the realities of pursuing a music career in Nashville and DIY touring are, we've got you covered! Below, Adam graciously shares his perspectives, experience, and advice for other artists on landing memorable, career-boosting gigs. How has living in a huge music city like Nashville helped your music career? It's inspiring to be surrounded by great songwriters and musicians. I feel like just about everyone I know is a musician. People always say that, in Nashville, your mailman, the guy who cuts your grass, etc., are all musicians. People here say this so much that it's kind of cliché, but it's also the truth. I started going to writers' nights when I moved to town 11 years ago. There are writers' nights every day of the week. It's cool because they're all a little different. They all have a vibe, and you can go from one to the next and sort of figure out where you fit in. At least that's how it seemed when I was frequenting them. I actually wrote a song called "Tall Tale Tuesday" that's about one such writers' night I found where I felt like I fit in. I don't go to these as much as I used to, but I met a lot of great writers and made good friends who I still play shows with on occasion. As far as the music business side of things go, I think people here are pretty accessible. I've made my last two records with an indie label called Me and the Machine. I know these days a lot of people who do what I do are just staying completely independent, but it's nice to feel like you have someone in your corner. I don't know much about the business side of things, so it's beneficial to have people to answer questions and bounce ideas off of. On the flip side, with so much competition there, you have to work that much harder to cut through the noise. What have been the biggest challenges for you in Nashville? The downside of Nashville is that it's difficult to get paid to play shows. I've only been getting out of town to play a bunch for the last couple years, and Nashville makes more sense to me when I play out of town and go back just to live, if that makes any sense. I think most touring bands that are out of Nashville only play in town on occasion or with other projects, which is how you're supposed to do it. I overplayed for a few years because I was working full-time and my day job made it difficult to tour, but I still wanted to play as much as possible. I've only played a handful of times in town over the last year and a half. Through Sonicbids, you were selected to perform at Music City Roots and Musikfest. What made you want to apply for those opportunities? Did the experiences live up to your expectations? Music City Roots is a well-known musical variety show in town. I had never submitted anything to them before, but when I saw it on Sonicbids, I was really hoping to be selected. I'd had a few friends who'd played it before, and they had great things to say about it. It was a lot of fun. I don't play with a full band very often, but I put one together for that show and we had a blast. They treat you really well there. Musikfest is in Bethlehem, PA, at Steel Stacks, which is an indoor/outdoor venue that's been created among the ruins of all the old steel buildings. It's really beautiful. People definitely make it out to support the festival. The audience was great – very attentive and appreciative. We had a wonderful time seeing other bands there as well. I've had some other good luck with Sonicbids submissions as well. I don't really know what the trick is. I submit for everything that interests me, and I've been lucky enough to be selected for a handful of submissions. It probably comes down to the law of averages to some degree like with everything else in life. I've obviously not been selected for more opportunities than I have been selected for, but it's fun to put your name in the hat. The opportunities that I have been selected for have been really good. In addition to your music, which is obviously the most important part, what do you think it was about your EPK that got you selected for those festivals? I think everything plays a small part. I've been actively playing and pursuing music at different levels for years now, so I've had a chance to build sort of a résumé of experiences. The same goes with the bio and social stats. If you do music and you're out there pursuing opportunities, it'll grow ever so slowly. My bio has changed drastically since I first began. Not just the résumé stuff, but the wording. I'm still constantly tweaking it. When given the opportunity to play a festival or big opener slot, what's your advice for leaving a lasting impression on the audience? If you perform enough, you sort of learn what works – what songs people respond to and what seems to be a good fit setlist-wise. If you just play a lot, whenever you can, little by little, you become familiar with what works for you. It may be different for every artist or band. You supported Australian singer-songwriter Stu Larsen on his North American tour last spring. How did you get invited to go on that tour? A fan of my music, who's now a good friend, went to a Passenger show and gave them my CD after the show. Stu was supporting Passenger, and he contacted me and said that he really enjoyed my CD. I had listened to his music also and expressed the mutual admiration. Within a couple months of being in contact, his manager wrote and said that he'd be doing a solo tour in North America the following year. She asked if I'd be interested in supporting him, and I said absolutely! That was that. The tour was amazing. I really enjoyed getting to know Stu. He's genuinely a great guy, and I can't imagine a better touring experience. It was just the two of us, and we drove over 8,000 miles in 28 days. What's the most surprising thing you learned about touring from that experience? At least with Stu's tour, it was very fast-paced. He tours constantly all year long. I think we spent two nights in a row in one place for the entire tour. Otherwise, it was one night in each city. It allows you to get just enough of a glimpse of places to want to go back when you have more time. The other thing is how different the audiences can be from show to show. I suppose I experienced this plenty before that tour, but when you're traveling so far and so often, I think you rely on good shows to keep your spirits up. You can experience highs and lows pretty drastically depending on the audiences from place to place. As an independent artist with success in landing big shows, what advice do you have on DIY touring for first-timers? I certainly haven't discovered any secrets. I just play as much as I can and submit to opportunities that I think would be great experiences. I did a lot of solo touring last year, which meant I spent a lot of time behind a computer going back and forth with venues. My goal this year is to play less, write more, and focus on trying to get quality shows. I'll continue to put my name in the hat and hopefully have some luck with more Sonicbids opportunities to help me accomplish that goal.